Dr. Farzad is always kind, pleasant, and patient. I always feel that he is listening to my concerns and does notrush me like other dentists. He speaks to you during your procedure to make sure that you are ok. I would recommend Dr. Farzad. Dr. Farzad is always kind, pleasant, and patient. I always feel that he is listening to my concerns and does not rush me like other dentists. He speaks to you duringyour procedure to make sure that you are ok. I would recommend Dr. Farzad. Staff was very welcoming and professional. Very helpful with my phobia of the dentist and very understanding. I would definitelyrecommend this team to anyone. **Please Note: Baltimore City Dental Group has a 24 hour cancellation/no show policy. Patients who cancel, no show or reschedule with less than 24 hours notice may need to pay a cancellation fee. 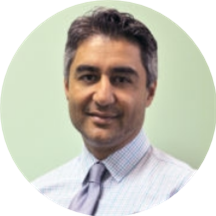 ** Dr. Farzad Azad has been practicing general dentist for 19 years. I am proud to say that ever since graduating from University of Maryland Dental School in 1995, I have never worked anywhere but here in Prince Frederick. Dr. Azad is the proud father of a little boy, Reza. I also have two Chihuahuas at home, Mooshi and Chewy. When I am not at work, you can find me skiing on the slopes or training for the next Marine Corps Marathon. My visit with Dr. Azad was great. I received a few fillings with Dr. Azad. He was very nice, professional, and regularly asked me if I was ok. He was also very gentle and had great bedside manner. I did haveto wait about 45 minutes after my appointment time to be seen, but I believe this is uncommon, as this day, Dr. Azad and his technician were the only ones there. The office is also very nice and comfortable. I look forward to continuing my treatment with Dr. Azad. Made me feel comfortable during the procedure and took his time. Always made sure if I was doing ok during the procedure and afterwards. Gave me appropriate guidance on post-op care. Would recommend to others. Great bedside manner and a true perfectionist! I am extremely pleased with my results. Great sense of humor and patient. I'll return back. This Dentist office was so amazing with service. I enjoyed my appointment and will be making this dentist my primary. I highly recommend dentist Azad. He is professional and provided quality care. I felt very comfortable and appreciate the ways he explained everything that was happen. I plan to continue my dental care there. My visit with the doctor was rather brief, however all the staff (receptionist and hygienists, techs) are super friendly and helpful. The staff was professional and polite. The wait time was very short compared to most Dr’s offices. Dr. Azad explained everything about my dental health to me and answered all my questions. He was very kind, patient and professional. I’m very pleased and would definitely recommend. Everything about this dentist office is exemplary! Had a root canal and several fillings done today all of which were completely painless. Everyone at the office is very kind and accommodating. From start to finish my appointment took about4 and a half hours due to the extensive work I needed. Despite this, the staff and doctors made the experience relaxed and pleasant. They are receptive to questions and attentive to detail. I would recommend this practice any day. Their hours also make them accessible if you have a busy schedule which is another plus. This was my first visit to Dr Azad. The staff was friendly and professional. They all made me feel very comfortable. I will be returning to this office and recommend to others to make your appointment with this great team. Great dentist and staff. They were very patient with me as I asked them 100 questions about the procedure. Would recommend! Friendly, kind, and attentive service. The staff was very friendly, efficient and explained everything to me. I will definitely recommend and return. I'm sending my whole office to him. He and his staff are lovely. Academy and team were great. I literally have avoided the dentist for my whole life. I really thought there was no amount of bedside manner or convincing that would make me willing to show up not once, but two days in a row. Dr. Azad andher team did a stellar job and really made me feel comfortable. After she told me I needed a root canal I needed almost an hour to calm down and move forward and they gave it to me and still saw me the same day. No pressure what so ever and a great temperament the whole time. Explained every step I wanted to know more about and when I wanted to throw headphones in and space out, they were cool with that too. I can’t say enough positive things about my experience, and I had a root canal. Not many people can say that! The best visit at the dentist I've ever had. The staff was very friendly and made the experience more enjoyable. Exceptionally educational, helpful and overall great experience! Staff was nice and kind, genuinely. Great doctor amazing staff very warm and welcoming and knowledgeable gentle. Awesome dentist! I made my appointment at the last min and they accomodated me very well. He's very knowledgeable and I would def recommend. The visit with this Dentist was like one i have NEVER, EVER, NEVER before in my lif encountered. He, and his staff are amazing !!!!! If I may also mention. This is the first time ever that I have had anextraction, and did not realize he had extracted the tooth. This was the most PAINLESS PROCESS. He is soft, gentle, and kind. Make NO mistake about it. His hands were blessed by a power greater than himself. I am so grateful. I came home, and I cried. I have a healthy fear of the Dentist. With this being said, I will be returning for at least two more extractions, and dental care thereafter. Thanks to Dr. Azad, and to his Team of professionals. This is my second time visiting this office and they are awesome! They are professional, friendly, knowledgeable, and efficient - and that goes for the entire staff. Everything was quick and easy. The staff was very welcoming and helpful. Every member of the staff was really cool! It took awhile for me to figure out who was who because they did not introduce themselves at first, but one hygienist did make an effort to explain. I also appreciate how theother hygienist explained what my policy covered and would not, and made recommendations for another plan I could go with. I have had bad experiences with dental offices that went through several procedures and then charging me all of them at the end, but not this place! The staff explained what each service was for and how much they would cost, making sure I agreed to them before they proceeded. Super nice and friendly, everyone in the office was very nice. The doctor was straight to the point and answered my questions. He showed a lot,of empathy, patience and understanding. I would highly recommend him and I have via word of mouth to others at my workplace etc. The staff and environment is very calming and peaceful. They are very empathetic and caring, especially Dr. Azad. I absolutely despise going to the dentist, but my visit at Dr. Azad's office was great! I'm used to leaving in tears (I know, I'm a wimp even for just routine cleanings) but I left all smiles today! The staff wassuper friendly and helpful and definitely made the experience better. So happy to have found my new neighborhood dentist!